Please note: These gem trees are shipped ready for safe transit in a box, so come with their wire branches laid flat or folded. So you will need to take your tree out and arrange the branches in a way that you desire. They can be changed again whenever you wish. Question: What is the Feng Shui Gem Tree? How Can I Use It as A Feng Shui Cure? What is the meaning of feng shui crystal trees, what are they used for and which ones to choose for which feng shui purposes? Can I use Swarowski crystals in my feng shui gem tree? Answer: Feng shui gem trees, also called feng shui crystal trees, are a popular cure in the traditional feng shui school applications. First thing to notice is the use of specific crystals in a tree, as each gem tree will usually come with one type of crystals, thus defining its feng shui application. There is a wide variety of feng shui gem trees on the market, from amethyst gem trees to agate and even pearl and coral trees. For example, citrine is a stone used forwealth and abundance purposes in feng shui, so a citrine tree will be used in the Wealth area, which is the Southeast area of your Bagua. A jade gem tree can be used for health in the East. A rose quartz is obviously for heart matters, love and romance, and is good in the Southwest area of the Bagua. Sometimes you will come across a colorfully mixed gem tree, which is excellent for use in your Children and Creativity area. Swarowski crystals are very pretty, but they do not have a strong feng shui energy because they have lead in them. 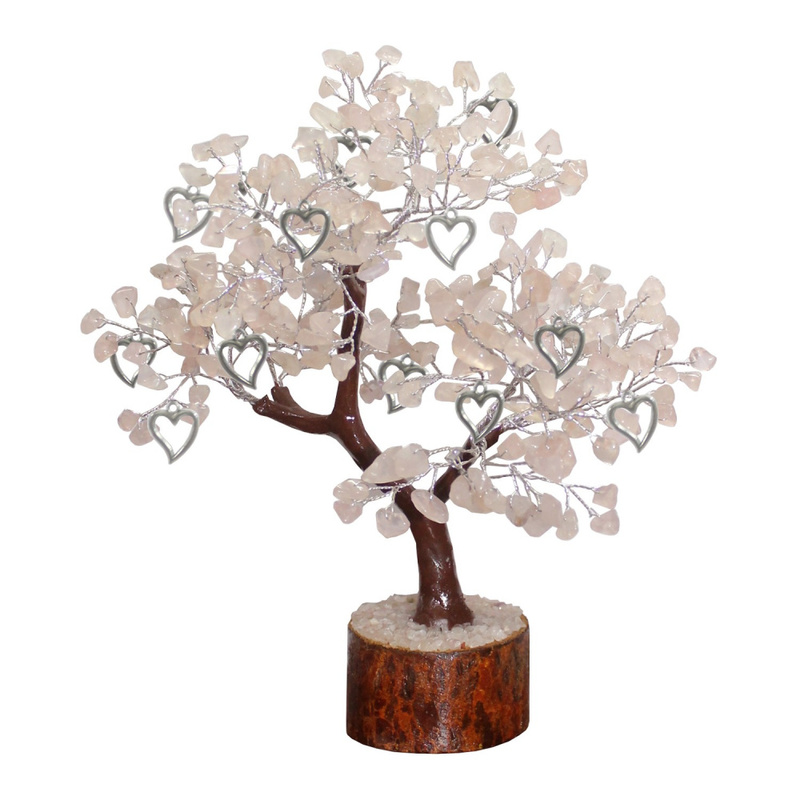 Best feng shui gem trees are made from natural/untreated rock crystals. If you want to, you can certainly add some Swarowski crystals to your tree for shine and sparkle, but a whole tree made just from Swarowski crystals may not have the energy you want from this feng shui cure. As to the shape and number of crystals, the more crystals, the better! After all, the tree symbolizes stability and growth, as well as a long life, so the idea is that in time you get more and more of what you focus upon/the seed of your planted intent. So, the visual of a feng shui gem tree is often one of abundance, like leaves on a tree, you will want to have the visual of too many to count crystals on your gem tree. You can add certain enhancements to a crystal tree, for example, Chinese coins for abundance, and this is where you can use auspicious feng shui numbers, such as 8 or 9 Chinese coins.